We just returned from a beautiful trip to Italy. 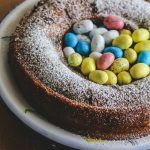 There is so much food I want to share and recipes (of course!!). As I figure out how to get back into the swing of posting recipes, I wanted to start off with one of the stops on our incredible itinerary. There was so much going on in our lives last year. 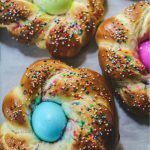 I somehow managed to keep posting a recipe at least once a week or sometimes every two weeks. Food is my passion and my life. I should correct that to say Italian food is the passion of my life. As we were dealing with a frightening illness in the family, my in-laws arrived twice from Italy to give us a much needed hand. Their second visit to us was in February and they left us at the end of March. I sort of couldn’t get my standing when they left. I was so used to their comfort and their delightful company. I felt as if I lost them or I guess I lost myself when they left. I was going through the motions of my days and dealing with missing their loving presence. My sweet in-laws were my lunch date every day…just the 3 of us. I watched Teresa make her Calabrian creations in the kitchen and tried to remember things as she was making them. I’ve watched her make these recipes for 17 years, and I try to recreate them when I’m not with her. I will put together some of the recipes from their stay and from our trip to Italy and start sharing them here with all of you. The month of April came and went and I found myself just counting down the days until we would be back in Italy with them and the rest of my extended family. Unfortunately this trip we wouldn’t make it to Sicily to be with my immediate family. My in-laws live half of the year near Lake Como. The rest of the year they are by the beach in Calabria (Reggio Calabria area). We try to take some trips around the Lake to explore new areas every year. This year during our last days there we planned a trip to my brother-in-law’s mountain house in a hamlet called Bugiallo. Have you ever heard of Bugiallo? I’m betting you have not as it has about 40 residents. Yes, 40!!! 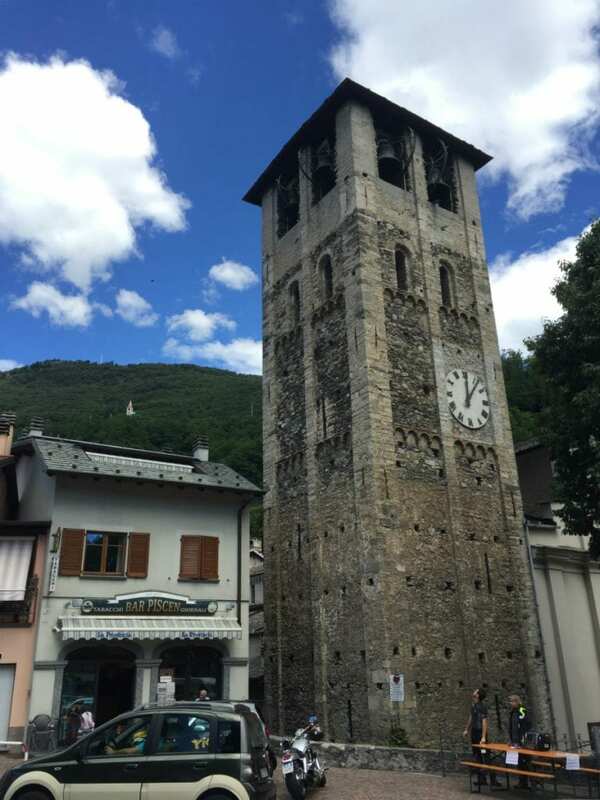 It is a medieval town that wraps around this tiny section of a mountain way above stunning Lake Como. It seems the way the town was built that every house has some view of Lake Como. On the way to Bugiallo, we were stopping to eat lunch. My brother-in-law had reserved for us somewhere where they had space for 12 people and a dog and I had no clue where it was. We stopped on the way to the mountain at a small town called Sorico. My sister-in-law wanted to show us the lake and to have us take a walk. 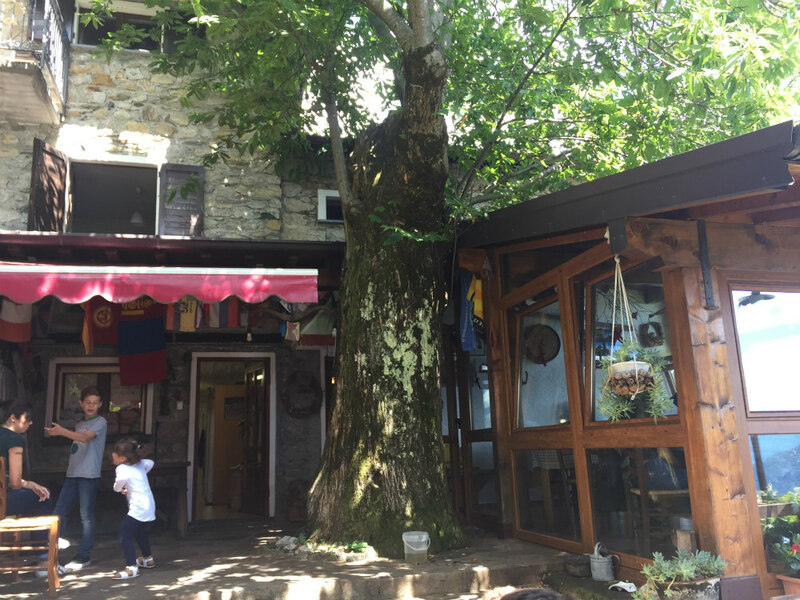 Sorico is a splendid lakeside town and it was busy with visitors and tourists. I’m imaging it gets busier as the summer progresses. 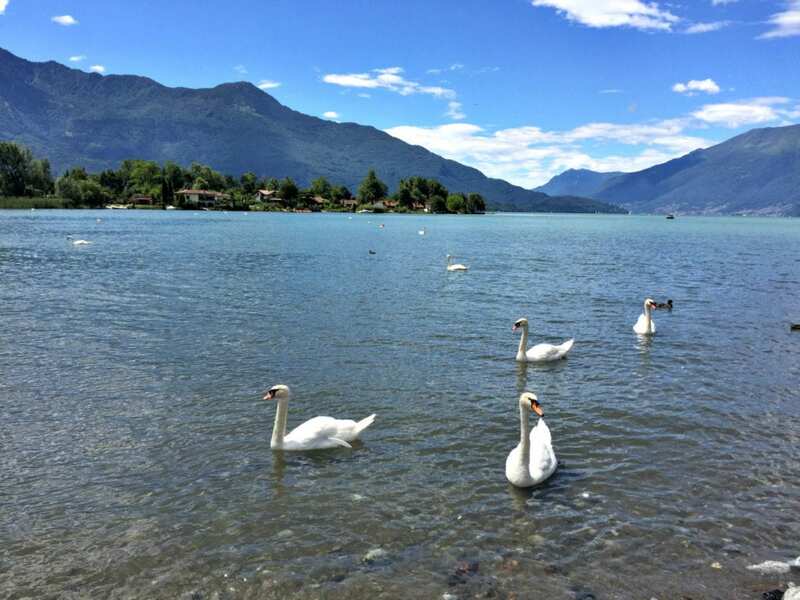 For the beginning of July, there really wasn’t any crowds and there were people taking sun, kids playing in the sand and beautiful swan swimming around and even walking on the sand bars. My kids had a blast trying to touch them and photograph them. The swans were having a great time fighting with my sister-in-law’s 7 month old puppy named Luna. At one point, I thought one of the swans would actually bite the poor pup. I never knew that swans were aggressive! If you are ever in this part of Lake Como, Sorico is absolutely lovely and worth checking out. After our short walk, it was time to head out to lunch. The troops were getting hungry (at least I was definitely ready for a proper Italian lunch in the mountains), so we all followed Alessandro up the mountain. Instead of going up towards Bugiallo, we went in the opposite direction towards Montemezzo. Now Montemezzo is not that much bigger than Bugiallo. Montemezzo has a pupulation of a bout 240 (more or less). We were on our way up the mountain, and none of knew how high up we were driving. There were two cars full of family following Alessandro in the first car. Every curve it seemed was getting higher and higher. We passed some beautiful houses and after about 5 minutes driving up, I thought we must be arriving shortly. We passed one place halfway up the mountain. I was so thankful when I saw the restaurant sign, but this was not our stop. Alessandro kept pushing up the mountain. He even pulled over on one tricky curve to let a group of motorcyclists pass us. We all struggled to get as close to the side of the mountain to let them zoom on their way further up the mountain. This is Lombardia ski country and I was trying to imagine how people do these roads with snow and ice. The roads do not have the safest barriers and you have to beep as you approach a curve to let anyone coming down the mountain know you are going up the mountain. Let’s just say it was 20 minutes of a scenic and totally frightening drive to an absolutely beautiful place. When we arrived outside of their property, there was a puppy awaiting us. It was hard to tell she was a puppy. Peppa is a Pyrenean mountain dog. Peppe was very excited to see a friend and walked with Luna (my sister-in-law’s puppy)and us to the entrance of the Rifugio. Alessandro called ahead and reserved our table of 12 with a puppy. They had told us it’s no problem to bring the dog and they had space outside for her to explore. My sister-in-law had a few words with Alessandro, as she had no clue the drive was so far up the mountain. 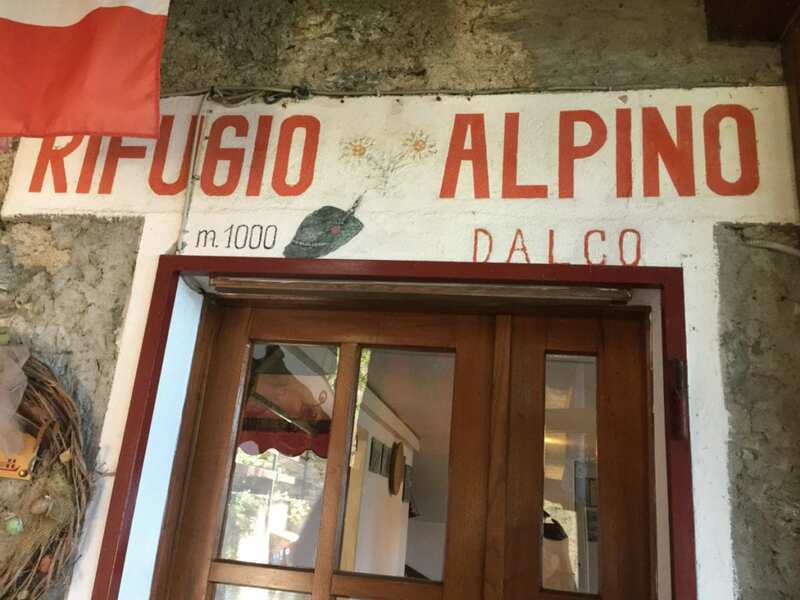 Alessandro had read great things about Rifugio Alpino Dalco on Trip Advisor and had wanted to visit for a while. He really didn’t know about the hairpin bends one after the other to get us there. As soon as we sat down, the waitress asked us for our drink orders and let us know she would bring out the first plates. It was a menu completa and we were having every thing that came with the prices. The first plate was this incredible plate of salumeria. It was all cured by them in their caverna outside. The bread was nice and fresh and I could have eaten just that for lunch. 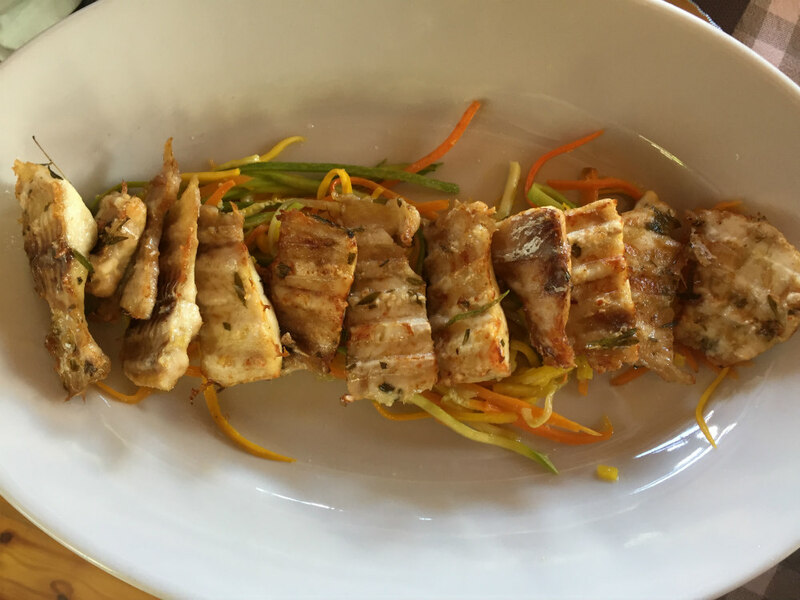 Next arrived this local lake fish that was grilled nicely and served over crispy vegetables. Around this time, I did hear the table next to us asking for something vegetarian. So it seems they have no problem accommodating vegetarians. 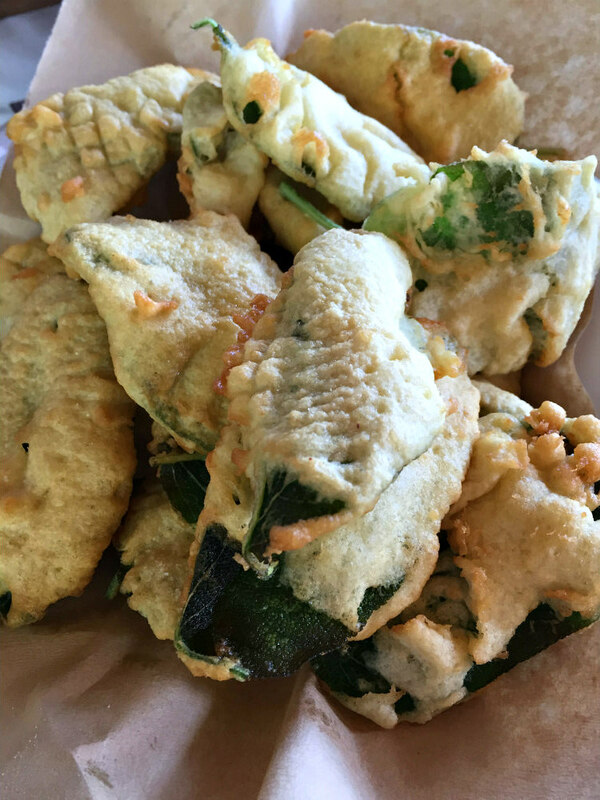 Up next were these sage fritters. The sage leaves were as big as my hands and they grow down below in their garden. Even the kids ate them and enjoyed them. 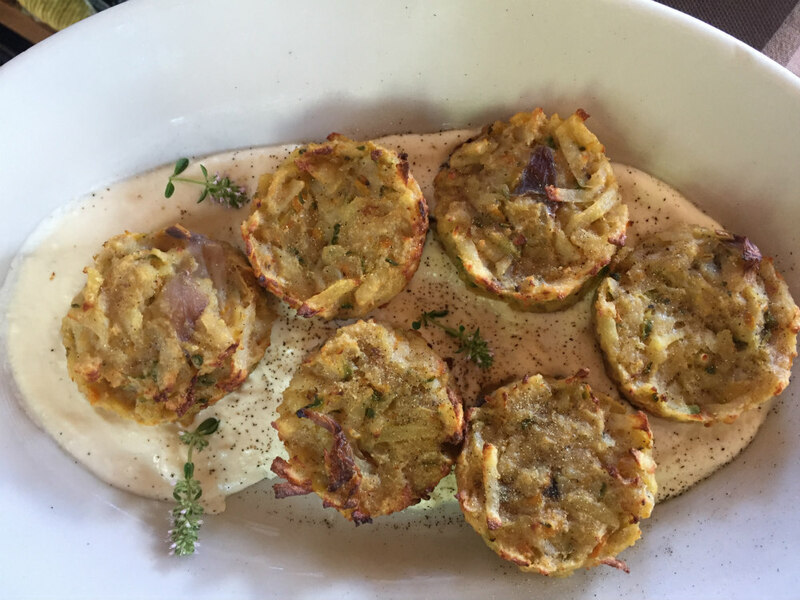 The next appetizer was potato and zucchini cakes served over a very rich fonduta. I’m not sure how I had room for any thing else after this point, but there was more to come. This was my favorite part of the meal. 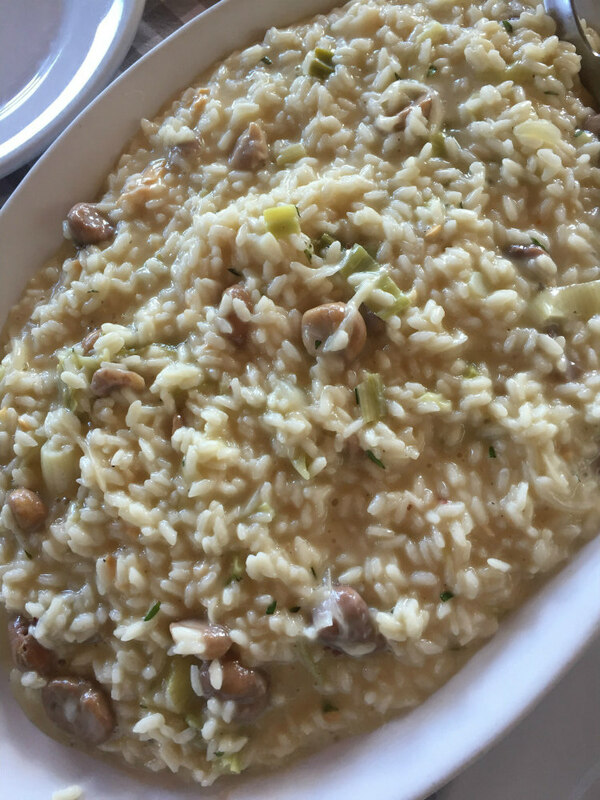 Risotto with chestnuts, leeks and scamorza. The chestnuts are from trees that are local and are 100’s of years old and the leeks are from their garden. They cooked the rice perfectly. It’s hard to get a great risotto at when you have a big party (or even a small portion). I seriously couldn’t eat another bite of rice, but I did eat about another 5-8 chestnuts. I knew I would probably not have such incredible chestnuts like this for a long time and enjoyed every one of them. After the risotto came the roast and the very thick polenta. 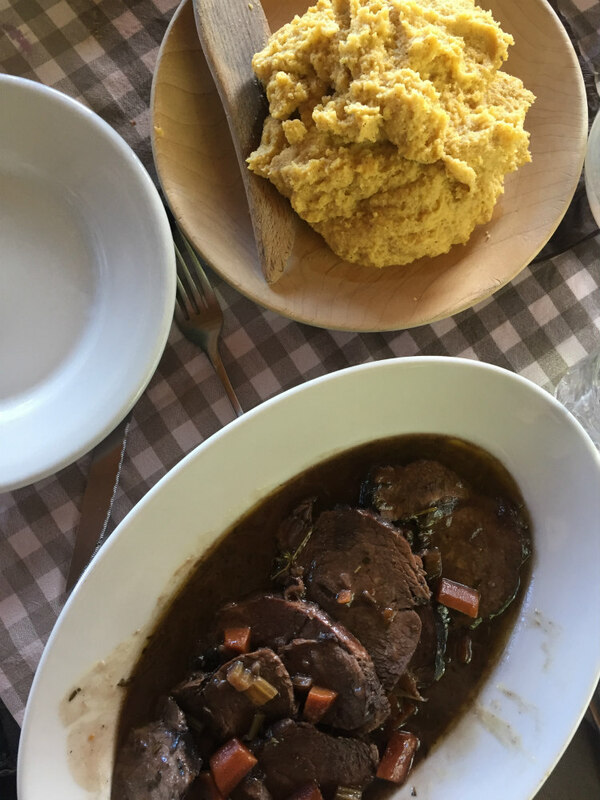 I usually have polenta that is thinner and this thicker polenta was more rustic and went perfectly with the very tender beef roast. I had just a bite as I wanted to say I tried it and know how it was. After the bite of the roast, some of us got up to walk around their property and check out the dog situation. Peppa was so behaved and was doing a great job watching Luna. Luna was very jealous that Peppa was walking around and she wanted to play and run around. 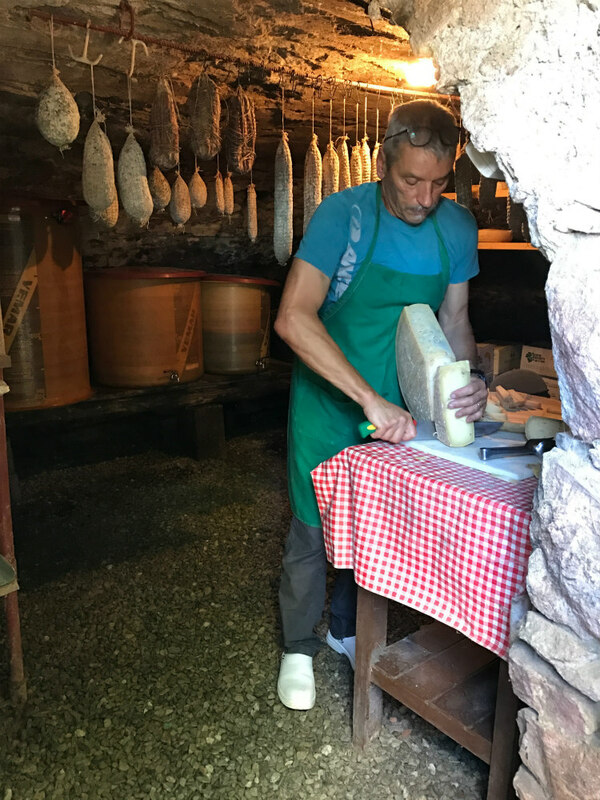 The owner showed us his caverna where his salumeria is kept and was slicing the cheeses that was part of the next course. Teresa was fascinated with his salumeria and asked him a lot of questions about how he cures them and other salumeria small talk. Teresa is quite the salumeria expert, so she is picky when trying other salumeria. The owner soon after appeared back in the dining room and arrived with a gigantic tray of four different cheeses. 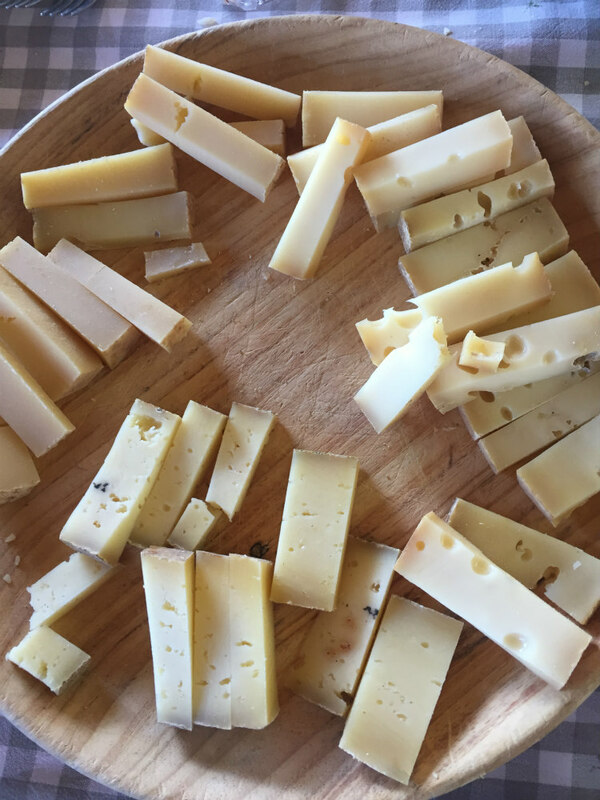 The cheeses were all from different areas around the lake and he described each cheese and what the flavor would be like. The presentation was quick and enticing. I couldn’t remember the names of each city by the lake and I did try a small bite of each of them. Each one had a distinct flavor and it was a perfect way to end the meal. The cheese was one part of the perfect ending of the meal. The next part was the dessert sampler that the wife made. There were two different apricot crostatas. One had walnuts and one was just with the jam. There was also a very soft and fluffy cake with chocolate chips (Teresa swore it had amaretti cookies, but I didn’t detect any). And the last dessert was a torta sbrisolana alle mele, which was everyone’s favorite! I made one and shared it here this year. I just made one again the other day, as everyone was craving it after this lunch. And here is Peppa. 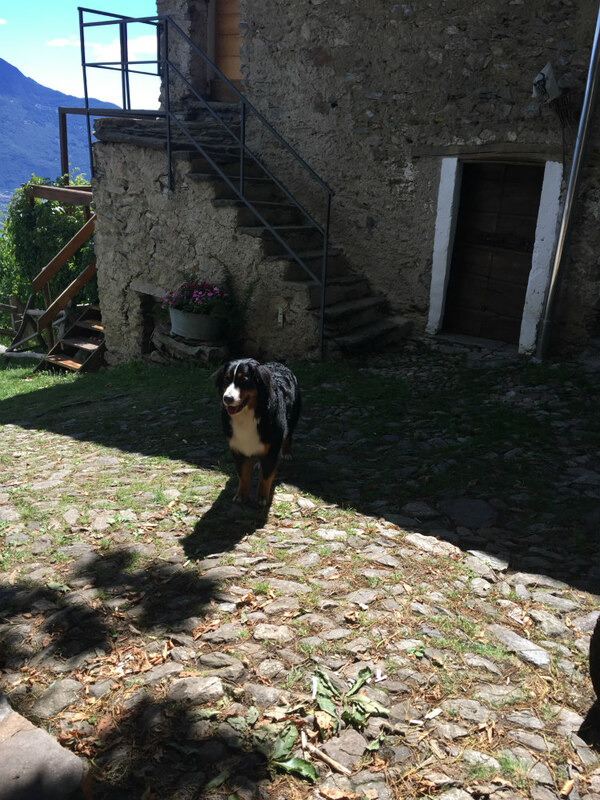 This sweet puppy was the hit of the Rifugio. Everyone wanted to take her home. She was so calm and so lovable. I never met a Great Pyrenees before. If I ever move to the mountains one day in Italy, I will have to remember to find a dog like Peppa. 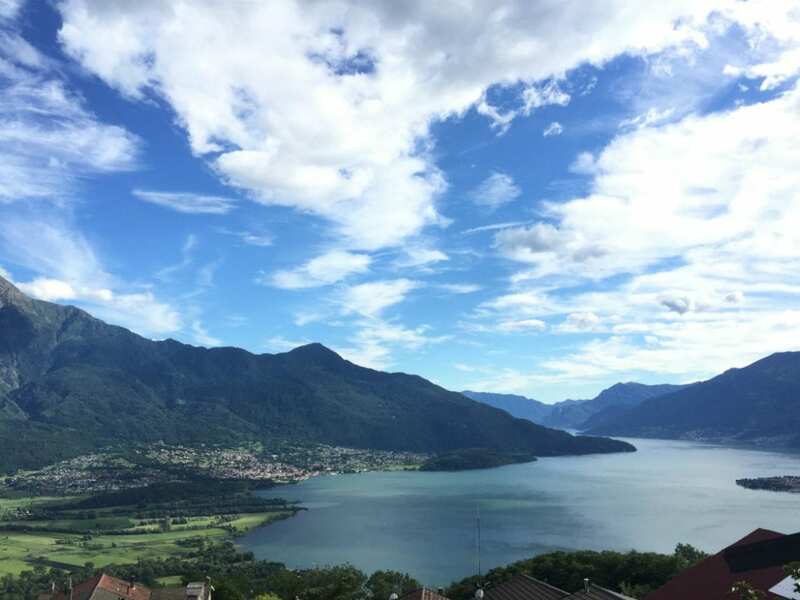 And if you ever make it to the mountains above Lake Como, you must be brave and take a chance on the long and winding roads with hairpin turns that lead you to a piece of paradise way above Lake Como. Rifugio Alpino Dalco is definitely worth a visit. They even have apartments to rent. 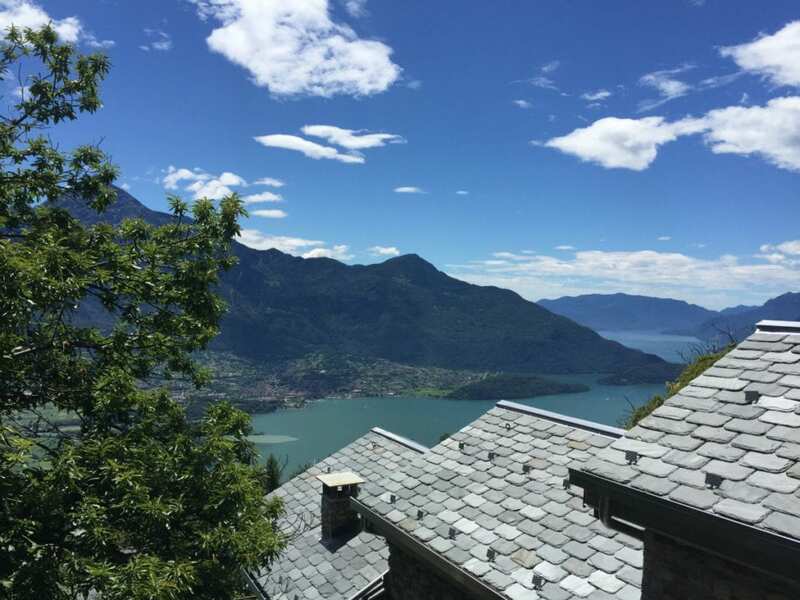 So if you’re exhausted after the long drive and the meal, stay for a day or two and explore the mountain a little bit and take in the breathtaking view of Lago di Como. you are making me wish for another trip to Italy. I've never been to this area but I can only imagine I would love it. Thank you!! You would love it! Oh my gosh, it's seeing pictures of dishes like these that make me all the more homesick for Europe, especially Italy. Everything looks exquisite. 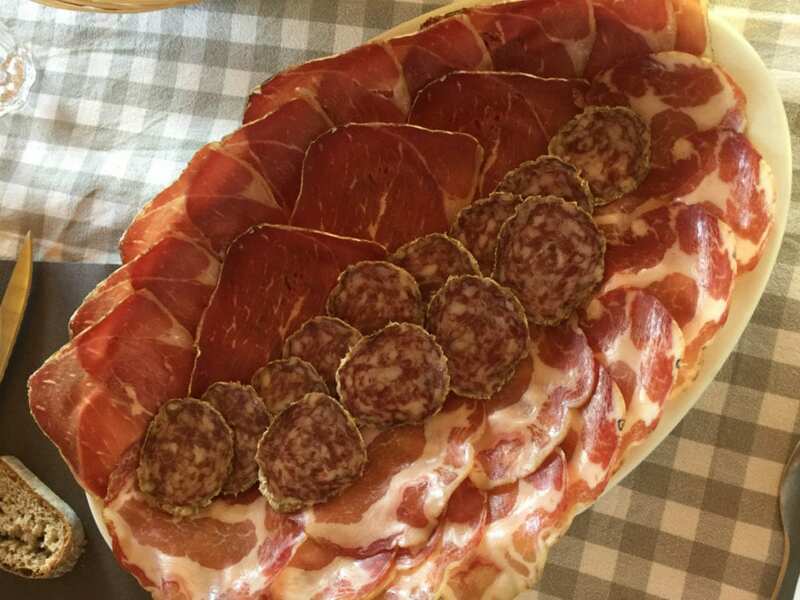 And that salumeria gets me so excited! Since moving to the U.S. I have especially missed the charcuterie and cheeses. 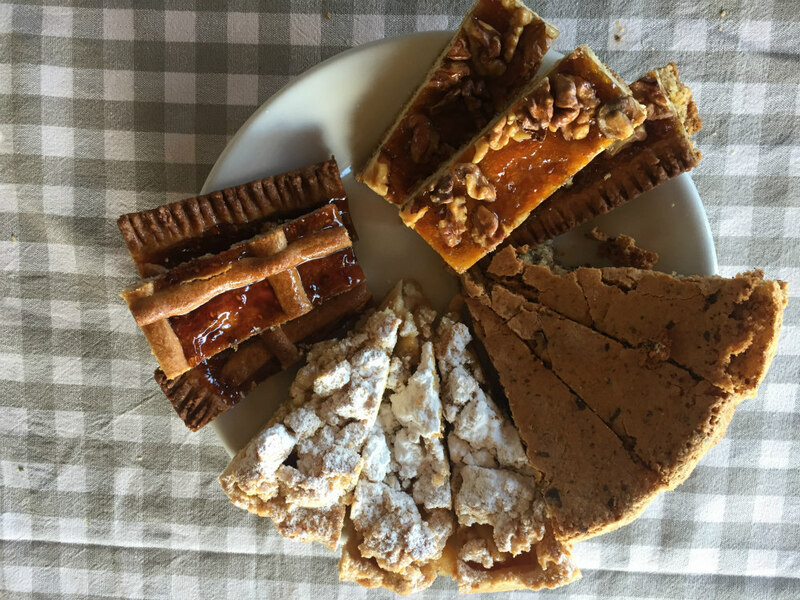 I've found some good sources locally to hold me over until the times we head back to Europe for visits, but I've been determined to master making some of them myself! I've got some capicola in the works right now and some coppa, pancetta and salami hanging up to dry-cure in our root cellar. My husband built me a cheesemaking chamber and tackling some hard, aged cheeses is next! 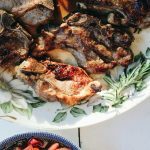 Beautiful post, Anna, thanks for sharing this and I look forward to the recipes you'll be sharing from you mother-in-law! Thank you, Kimberly! I appreciate your thoughtful comment and I loved reading that you are making some of your own things now in your root cellar. How exciting that you have a cheese making chamber!! Can't wait to see some of your posts about all you will be making at home! What a wonderful culinary experience. I would love to go to Italy some day. My mom was born and lived in the Palermiti Calabria area. How wonderful your mom is from Calabria! My in-laws are from there and I hope you make it one day. 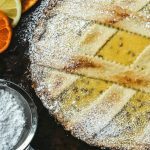 It's so beautiful and the flavors of Calabria are unique and delicious! What an amazing trip! The views are stunning and that food! Everything looks so good. Italy is #1 on my bucket list and I hope to get there sooner rather than later! Thank you so much, Sarah! It was all delicious and I hope you make it there one day in the future! Lora, I love all your photos. They make me feel like I was there with you. We should seriously plan a blogger retreat in Italy. Or I should go with you next time you visit. I've never been to Italy and I'm just chomping at the bit to go. It looks incredible. I particularly love that each region and province of Italia has its own culinary view point. There is always something new to learn. Hi Lisa, it's so true! I have so much to learn about so many of the regions. I feel every time I learn more, so much is missing! Thanks for your thoughtful comment! Your photos are sbsolutely amazing – I want to be there (and eat all of that) so badly! Great job for publishing such a beautiful web site. 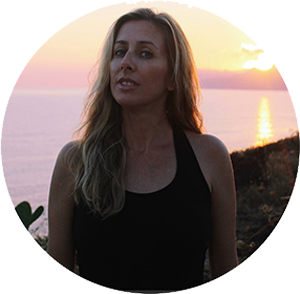 Your blog isn’t only useful but it is also really creative too.